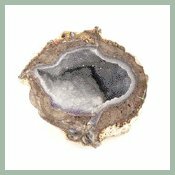 Geodes: What Is A Geode? Geodes are like the Tootsie Roll Pop of the geology world because underneath the hard exterior lies a surprise center! So, let’s start at the beginning: how do you get a hollow rock with lots of sparkling crystals inside? First you need a hollow rock. 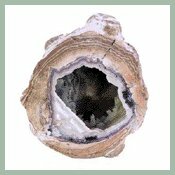 Geodes start their lives as a hollow bubble inside a layer of rock. The bubble could be from air inside explosive volcanic rock or it could come from the hollow remains of animal burrows or tree roots. When these rocks form from air bubbles inside of volcanic rock it is pretty easy to picture. Think about the small air bubbles you see in pumice. Now, imagine just one of those bubbles completely surrounded by black or red volcanic rock. As rain pelts down on the hot bubble, the chemicals in the rock are slowly released into the water. Some of the water soaks through the hard, rocky outside of the bubble and is trapped for a moment on the inside. As the mineral-rich water moves on through the bubble, tiny crystals are left behind, clinging to the sides of the bubble. Millions of years pass while this in and out flow of water gradually builds crystals inside the empty space. The crystal formations might become large single crystals or tightly packed micro-crystals, so small that you can’t even distinguish one from another. Let’s check out the development of our animal burrow bubble… Long after the animal has moved on or the tree has died and its roots have rotted away, the sediments that surrounded the hollow are being covered up by layers and layers of sediment hundreds of feet thick. Eventually the weight of these layers has caused the sediments to turn into rock: sedimentary rock. Just like our volcanic bubble, this animal burrow bubble is host to mineral-filled water flowing in and out through the hollow space. And just like the volcanic bubble, a wide variety of crystals are taking shape inside the animal’s former home. Fast forward to modern times. The water-soaked land where our bubbles began has become a vast desert where wind howls and the sun beats down. The ground, covered by rocks and scrubby brush yields up unusually shaped rocks. Today, you’ve found a good field of them and have three nearly-round specimens to crack open when you get home. The first one is quite hollow but for a nice layer of medium-sized blue crystals. These dugway geodes have bands of blue and pink. The geode at the left and the one at the top of the page are both dugways from Utah. The colors come from the different minerals that flowed through the bubble so many millions of years ago. Another specimen is nearly solid all the way through. The microcrystals have formed wide bands of different colors and the tiny opening at the center has a thin ring of pointed crystals. Yet another is completely filled with solid rings of browns, reds and pinks. So, you’ve really found two geodes and one nodule. Nodule is the name for these round forms when they are filled solid. As each specimen offers up a different interior, you wonder, “What causes all the colors?” So you head to the computer and you’ve arrived at this page, so I’ll need to tell you. Remember the mineral-rich waters that flowed through the bubbles forming crystals inside? There is a variety of elements that can be present in mineral water. It would all depend on the type of rocks the water passed over and through on its way to the geode. Rocks contain iron, magnesium, sulfur or a host of other elements. Now, think about the variation that can occur in terms of saturation amounts of the different minerals. You can imagine that the different rocks forming from all these variations could be limitless. But there is some consistency that makes it easier for us. 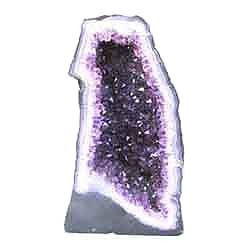 Most geodes have interiors made of either quartz or calcite. Quartz crystals are silicates. Silicates are the most common mineral in the crust of the earth. Over 90% of the minerals present in earth’s crust are silicates. With this said, you can imagine that silicates are a pretty big group with lots of variation in terms of specific chemical composition. Calcite’s main ingredient is calcium carbonate CaCO3: dissolved calcium and carbon with some of the oxygen from the water thrown in. Now, add in a trace of iron or magnesium or copper and, voila, you have color variation. Calcite with magnesium and a trace of manganese forms a nice pink dolomite layer, while iron in silicate accounts for the purples of amethyst. Now if your geode was close to a lot of heat, that could change the color, too. An amethyst that gets a lot of heat loses its purple color and becomes a soft yellow or citrine. You can see why there are so many color possibilities. So, that little geode you’re holding has had quite a journey getting to your hand. Treasure it for its beauty, but also for its history and the complex composition of minerals that made it. You’re holding millions of years of work in your hand…enjoy touching the miracle of our earth’s creation.